SAM AND DEAN MEET THEIR GRANDFATHER — Sam (Jared Padalecki) and Dean (Jensen Ackles) are stunned when a man who claims to be Henry Winchester (guest star Gil McKinney), their grandfather, suddenly appears in their hotel room demanding to know where he can find John Winchester. Henry has time-traveled to stop a demon named Abbadon (guest star Alaina Huffman) and was looking for John’s help. Through Henry, Sam and Dean learn more about their father and the Winchester bloodline. Serge Ladouceur directed the episode written by Adam Glass. 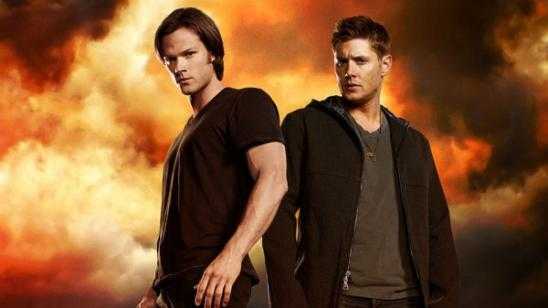 For more info visit "Supernatural" on cwtv.com, "like" "Supernatural" on Facebook, and follow @CW_network on Twitter. DANGEROUS LIAISONS — When Rebekah (Claire Holt) turns down Klaus’ (Joseph Morgan) plea to stop Kol (Nathaniel Buzolic) and protect Jeremy (Steven R. McQueen), Klaus turns to Stefan (Paul Wesley) for help. After an angry confrontation with her father, Mayor Hopkins (guest star Rick Worthy), over his unconventional approach to ending the violence in Mystic Falls, Bonnie (Kat Graham) has a frightening run-in with Kol, followed by an unexpected visitor. Klaus complicates the already tense feelings between Stefan and Damon (Ian Somerhalder) by revealing a bit of Stefan’s personal life, then surprises Damon by asking for personal advice. Elena (Nina Dobrev) tells Stefan about her dangerous plan for Jeremy, leaving Stefan in a difficult spot. When the high school’s 1980s Decade Dance is cancelled by Mayor Hopkins, Stefan finds a charming way to make it up to a disappointed Rebekah. Brad Turner directed the episode written by Rebecca Sonnenshine. For more visit "The Vampire Diaries" on CWTV.com, "like" "The Vampire Diaries" on Facebook, and follow "The Vampire Diaries" on Twitter. Official Synopsis: This television drama is about the two Winchester brothers, Sam and Dean, who were raised by their father, John, to hunt and kill all things that go "bump in the night" after his wife, Mary, was murdered by an evil supernatural being when the boys were young. 22 years later the brothers set out on a journey, fighting evil along the way, to find their recently missing father who, when they finally meet up with, reveals he knows what killed their mother, a demon, and has found a way to track and kill it. Meanwhile, Sam starts to develop frightening abilities that include death visions, visions of people dying before it actually happens. These visions are somehow connected to the demon who murdered his mother and its mysterious plans that seem to be all about Sam. When their father dies striking a deal with the very same devil that had killed his wife, the brothers, now alone and without their mentor, are determined to finish the crusade their father started. But disturbing revelations about Sam's part in the demon's apocalyptic plans are presented when John's dying last words to Dean are revealed.